Day-to-day living wrapped in Western charm. Downtown Durango, CO is a Nationally Registered Historic District with boutique hotels, world-class restaurants, unique art galleries and museums. Stroll through the streets and you will find cozy brewpubs alongside one-of-a-kind stores. Durango, Colorado was first developed in the late 1800s by William Jackson Palmer, who founded the Denver and Rio Grande Railroad. In a rich valley, Palmer saw potential. The area was rushing with miners hoping to strike gold, silver or copper, so the railroad laid tracks between Durango and Silverton to help move the metals. People quickly recognized the thrill and splendor of a mountain train ride and the depot became exceedingly popular. Today, you can still travel aboard the now-famous Durango & Silverton Narrow Gauge Railroad and visit the Railroad Museum. Authentic historic sites. Durango's Main Avenue was designed for commerce. On the parallel, Third Avenue was planned as a sprawling residential street with a grand median of trees. Both are safe to explore day or night. Many of the original pioneer buildings are still standing, including the opulent Strater Hotel, constructed in 1887. Take a leisurely walk on the Animas River Trail, which winds through town. Traveling with youngsters? Take them to explore the Durango Discovery Museum. With interactive and educational displays, this dynamic science center is a great place to spend a few funfilled hours. If you love the outdoors, you may also consider hiking, biking, rafting, camping, boating, or horseback riding in the Durango area. "The living room of the Durango community." The downtown center is a hub of culture and activity with special events that take place throughout the year. The Iron Horse Bicycle Classic, a road and mountain bike tournament is the longest continuously run cycling event in the U.S. The Durango Double also challenges marathon-driven athletes. The winter celebration called Snowdown has endured generations and a slew of fun-filled festivals, including the Durango Meltdown (bluegrass festival), Cowboy Gathering, Summer Jazz Festival, Oktoberfest, Durango Arts Festival, Holidazzle lure residents and visitors to historic downtown Durango. 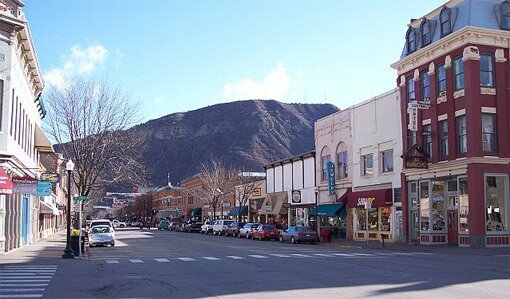 Whether you prefer reading a good book in a gourmet coffee house, browsing eclectic shops or partaking in the season's festivities, you will undoubtedly love Durango! The National Trust for Historic Preservation listed this delightful mountain town as one of America's Dozen Distinctive Destinations in 2007. It's certainly worth a visit.